The mispricing of risk in the pursuit of yield is often a classic early warning sign of late-cycle investor complacency during periods of abundant liquidity and sustained low volatility. Corporate issuance today is red hot and the reduction in total yields in credit markets is striking. In the past three years, the spread between traded A and BB-rated securities has declined from 350 bps to only 150 bps (refer below chart). In other words, the risk premium has MORE than halved. Tesla is another recent example. After issuing $US1.8bn of 8-year high yield bonds in August 2017 at 320 bps above Treasuries, production issues and massive cash burn have significantly dented valuations. A downgrade from Moody’s to Caa1 (only 4 notches above default) saw Tesla’s bonds, issued at $US100, plummet to ~US$86 (~$US88 today). 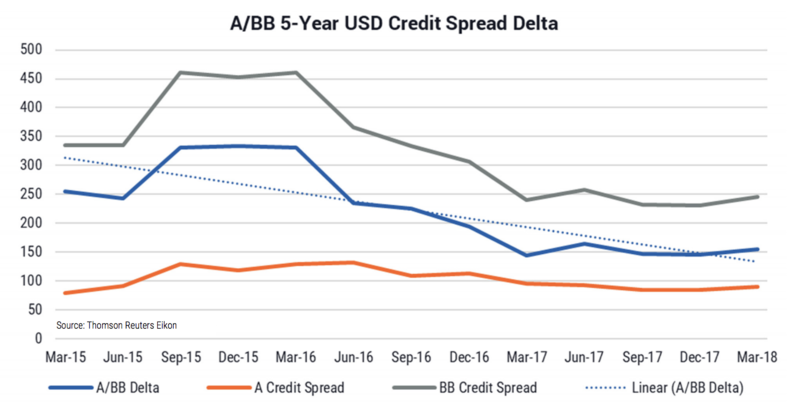 With Tesla having no track record in mass production – Elon Musk’s “deep production hell” tweet was telling – the deterioration in credit spreads (~100 bps wider since issuance) is perhaps unsurprising. Last week Netflix, a company in a similar situation to Tesla (high cash burn), issued $US1.9bn of new 10.5-year debt at a yield of 5.875% and ~2.9% over Treasuries. Though there are some differences between the two, a B/BB rated issuer successfully placing 10-year debt at these margins provides further evidence of late-cycle investing behaviour. Sovereign debt, too, has had its fair share of remarkable deals. Argentina’s success in issuing $US2.75bn of 100- year single B rated bonds in mid-2017 for a measly 7.906% yield was extraordinary: Argentina last came out of default in 2016 (its eighth default and fourth in the past 25 years). Put another way, the country is a serial defaulter. Looking at both these deals, we’re reminded about former Fed Chairman William Martin’s quip about the importance of “taking away the punch bowl just when the party gets going.” For issuers it seems the party is in full swing. These two recent examples aside, there are still plenty of opportunities for discerning credit investors to access higher risk-adjusted returns. At the same time Argentina issued its 100-year bond, Australian names NEXTDC and Peet Ltd issued ASX-listed notes offering investors some much needed diversification away from financials and, in our view, a superior risk-reward profile. And, critically, both Next DC and Peet Ltd issued paper at a comparable yield to Argentina’s and more than a lifetime shorter…. 96 years shorter to be exact!